Vienna Arbitration. 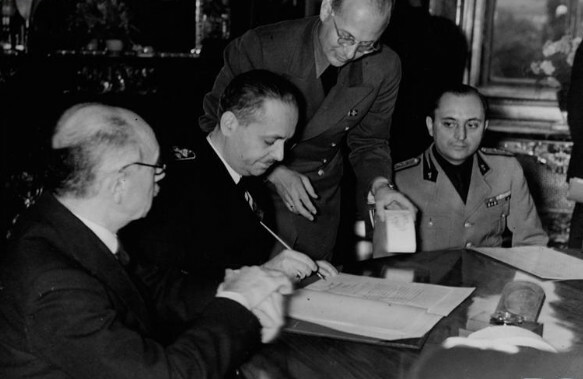 The name given to two agreements signed in Vienna by Germany and Italy in 1938 and 1940 repealing the Treaty of Trianon and ceding considerable territory from Czechoslovakia and Romania to Hungary. The first of the agreements (2 November 1938) compelled Czechoslovakia to surrender to Hungary the southern areas of Slovakia (including parts of the Prešov region) and parts of Ukrainian Transcarpathia. The latter area constituted 1,545 sq km of territory, with a population of 182,000 (of whom 30,000 were Ukrainians), and included the region’s capital, Uzhhorod, as well as the cities of Mukachevo and Berehove. The second arbitration (30 August 1940) saw northern Transylvania ceded by Romania to Hungary and did not affect Ukrainians specifically. The Vienna arbitrations were annulled in the Paris Peace Treaties of 1947.